to kick off her portrait session. There were great locations everywhere and we took full advantage of the gorgeous scenery within the community. There is a covered bridge, a weathered barn, a pond with a gazebo, and of course, the stunning fairways of the Tom Fazio designed golf course. Just a spectacular neighborhood! Kinser is also a repeat pageant head shot client of ours so she knows a thing or two about posing and what I am looking for during a session. She was knocking out the poses left and right and it shows. Her wardrobe selections were great as well, making her stand out in every scene we shot in. What a fun session! 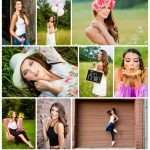 If you are looking for the PREMIER senior portrait experience in the region, look no further! Contact us today to book YOUR session!